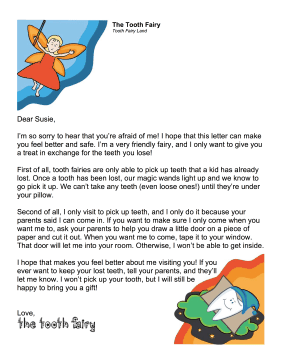 Help your child feel safer and more comfortable with the idea of the tooth fairy using this soothing sample letter. I'm so sorry to hear that you're afraid of me! I hope that this letter can make you feel better and safe. I'm a very friendly fairy, and I only want to give you a treat in exchange for the teeth you lose! First of all, tooth fairies are only able to pick up teeth that a kid has already lost. Once a tooth has been lost, our magic wands light up and we know to go pick it up. We can't take any teeth (even loose ones!) until they're under your pillow. Second of all, I only visit to pick up teeth, and I only do it because your parents said I can come in. If you want to make sure I only come when you want me to, ask your parents to help you draw a little door on a piece of paper and cut it out. When you want me to come, tape it to your window. That door will let me into your room. Otherwise, I won't be able to get inside. I hope that makes you feel better about me visiting you! If you ever want to keep your lost teeth, tell your parents, and they'll let me know. I won't pick up your tooth, but I will still be happy to bring you a gift!